Even the most advanced technologies grow old. Sooner or later, spare parts are no longer produced or repair costs become unjustifiable. R&S®Obsolescence Management offers a solution: It monitors the availability of all your system components and spare parts as well as the presence of in-house software and service skills. The basic service package ensures you an optimal overview. We notify you as to when a spare part will no longer be available, at regular intervals or when sudden, unforeseen circumstances arise. The advanced service package includes all the benefits of the basic service package plus additional advantages. We assess your inventory to determine the availability of your spare parts. We continuously check your needs and develop means to cover them in the long term. To make it even simpler for you, we examine your active systems and products for opportunities to use components and spare parts for other purposes. The premium service package builds on the advanced service package to ensure you comprehensive protection in all areas. For spare parts that are no longer available, we research procurement opportunities and provide you with a cost estimate. We also present possible reconfiguration options for your systems and products. Our highly capable service organization is rigorously centered around your specific needs and requirements. You benefit from flexible service concepts designed to bring you sustained benefit and long-term satisfaction. 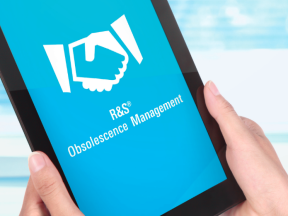 In five steps our R&S®Obsolescence Management helps you to get the best service for your systems and products. Learn more about our services. For a fixed price, we analyze your situation and develop a framework for an obsolescence management strategy tailored to your requirements. Building on the initial analysis, our qualified obsolescence managers work with you to select a service package that meets your requirements. We create an ̧Obsolescence Management plan based on your service agreement containing everything you need to know. Your R&S®Obsolescence Management plan covers every detail of our cooperation, from the manufacturers involved to analysis/solution process responsibilities and status report frequency. During the analysis phase, we determine all of the steps you need to take to best safeguard your future based on your spare parts inventory, your needs and the life expectancy of your systems and products. We take into consideration your availability requirements for Rohde & Schwarz systems and products as well as those from other manufacturers. After determining your requirements and needs, we begin searching for the spare parts and system components you require. We maintain close contact with suppliers and manufacturers in order to locate alternative procurement sources. And we provide you with functional reconfiguration options for systems and products to ensure their long-term functionality. We create a status report based on our findings to inform you of all required steps as well as estimated costs, expected duration and possible risks. 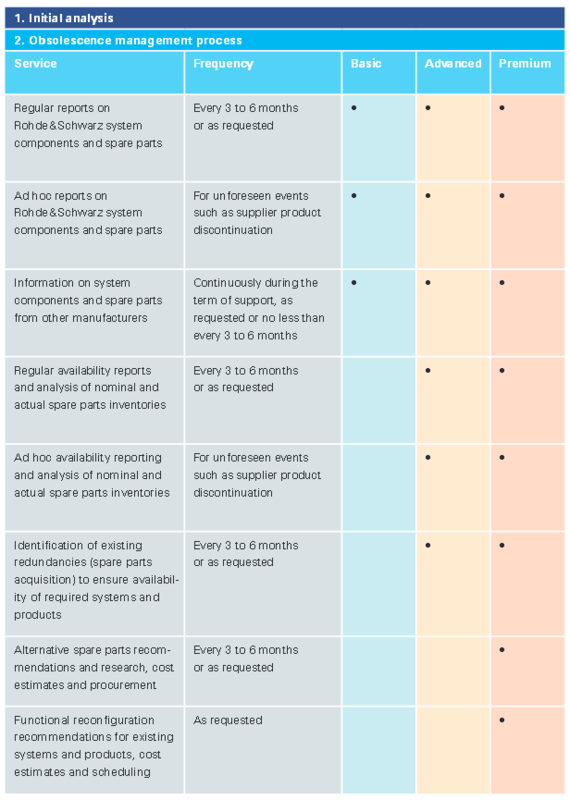 Depending on the provisions of your service agreement, you will receive your status report at regular intervals or after short-notice changes in your spare parts supply chain.